SINGAPORE - Singapore comes in a surprising 9th out of 10 Asia-Pacific (APAC) countries when it comes to consumers' trust in digital services, according to a survey released on Monday by global information services firm Experian and market researcher International Data Corporation (IDC). While many would expect countries like Singapore and Hong Kong to fare better due to advanced fraud management systems in place, the survey found that consumers in such advanced economies tend to have a lower tolerance for fraud and perceive that companies are not managing the post-fraud experience well. Paradoxically too, greater acceptance of fraud was found in countries where fraud incidents are the most prevalent, the survey found. "The relatively low score of 2.3 out of 10 in Singapore indicates that there is a divide between how businesses think they manage fraudulent digital transactions, and the actual customer experience when fraud does occur," said Dev Dhiman, Experian Asia Pacific's managing director, South-east Asia and Emerging Markets. Singapore consumers, though, are most trusting of the government - particularly when it comes to personal data protection - with over 75 per cent of those polled saying they trust government agencies, way above the APAC average of 51.7 per cent. The survey also found that 18.5 per cent of Singaporeans were directly impacted by fraud in the past 12 months, while 32.7 per cent had fraud happen to them or their loved ones. Across APAC, trust in digital services is relatively low with the region scoring 3.2 out of 10.0, with telcos at the bottom with a score of 2.1 and financial services topping at 4.9. 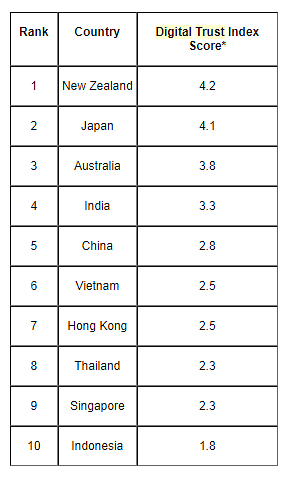 Among South-east Asian countries surveyed, Vietnam ranked the highest at No 6 with a score of 2.5, ahead of Thailand (2.3), Singapore (2.3) and Indonesia (1.8). "Trust is an essential currency for this new digital world and as Singapore and the region continues to digitise, it is imperative that organisations ensure trust in their digital offerings are high," said Mr Dhiman. The figures are captured in the survey's Fraud Management Insights 2017's Digital Trust Index. The index is based on four variables - the level of digital adoption, industry preferences, fraud rates, and the effectiveness of companies' fraud management capabilities. To increase customer trust in digital services, the Digital Trust Index identified three key gaps for service providers to address to strengthen trust with their customers. In order to address these gaps the report suggested that firms: utilise automation to combat fraud that arises from digital transactions, improve their ability to deploy fraud management and detection and to future-proof their fraud detection capabilities.